That lack of adequate reporting fuelled the development of the original CONSORT (Consolidated Standards of Reporting Trials) statement in 19965 and its revision five years later.6 7 8 While those statements improved the reporting quality for some randomised controlled trials,9 10 many trial reports still remain inadequate.2 Furthermore, new methodological evidence and additional experience has accumulated since the last revision in 2001. Consequently, we organised a CONSORT Group meeting to update the 2001 statement.6 7 8 We introduce here the result of that process, CONSORT 2010. The CONSORT 2010 Statement is this paper including the 25 item checklist in the table⇓ and the flow diagram⇓. It provides guidance for reporting all randomised controlled trials, but focuses on the most common design type—individually randomised, two group, parallel trials. Other trial designs, such as cluster randomised trials and non-inferiority trials, require varying amounts of additional information. CONSORT extensions for these designs,11 12 and other CONSORT products, can be found through the CONSORT website (www.consort-statement.org). Along with the CONSORT statement, we have updated the explanation and elaboration article,13 which explains the inclusion of each checklist item, provides methodological background, and gives published examples of transparent reporting. Diligent adherence by authors to the checklist items facilitates clarity, completeness, and transparency of reporting. Explicit descriptions, not ambiguity or omission, best serve the interests of all readers. Note that the CONSORT 2010 Statement does not include recommendations for designing, conducting, and analysing trials. It solely addresses the reporting of what was done and what was found. Nevertheless, CONSORT does indirectly affect design and conduct. Transparent reporting reveals deficiencies in research if they exist. Thus, investigators who conduct inadequate trials, but who must transparently report, should not be able to pass through the publication process without revelation of their trial’s inadequacies. That emerging reality should provide impetus to improved trial design and conduct in the future, a secondary indirect goal of our work. Moreover, CONSORT can help researchers in designing their trial. Efforts to improve the reporting of randomised controlled trials accelerated in the mid-1990s, spurred partly by methodological research. Researchers had shown for many years that authors reported such trials poorly, and empirical evidence began to accumulate that some poorly conducted or poorly reported aspects of trials were associated with bias.14 Two initiatives aimed at developing reporting guidelines culminated in one of us (DM) and Drummond Rennie organising the first CONSORT statement in 1996.5 Further methodological research on similar topics reinforced earlier findings15 and fed into the revision of 2001.6 7 8 Subsequently, the expanding body of methodological research informed the refinement of CONSORT 2010. More than 700 studies comprise the CONSORT database (located on the CONSORT website), which provides the empirical evidence to underpin the CONSORT initiative. Indeed, CONSORT Group members continually monitor the literature. Information gleaned from these efforts provides an evidence base on which to update the CONSORT statement. We add, drop, or modify items based on that evidence and the recommendations of the CONSORT Group, an international and eclectic group of clinical trialists, statisticians, epidemiologists, and biomedical editors. The CONSORT Executive (KFS, DGA, DM) strives for a balance of established and emerging researchers. The membership of the group is dynamic. As our work expands in response to emerging projects and needed expertise, we invite new members to contribute. As such, CONSORT continually assimilates new ideas and perspectives. That process informs the continually evolving CONSORT statement. The revision process resulted in evolutionary, not revolutionary, changes to the checklist (table⇑), and the flow diagram was not modified except for one word (figure⇑). Moreover, because other reporting guidelines augmenting the checklist refer to item numbers, we kept the existing items under their previous item numbers except for some renumbering of items 2 to 5. We added additional items either as a sub-item under an existing item, an entirely new item number at the end of the checklist, or (with item 3) an interjected item into a renumbered segment. We have summarised the noteworthy general changes in box 1 and specific changes in box 2. The CONSORT website contains a side by side comparison of the 2001 and 2010 versions. We developed CONSORT 2010 to assist authors in writing reports of randomised controlled trials, editors and peer reviewers in reviewing manuscripts for publication, and readers in critically appraising published articles. The CONSORT 2010 Explanation and Elaboration provides elucidation and context to the checklist items. We strongly recommend using the explanation and elaboration in conjunction with the checklist to foster complete, clear, and transparent reporting and aid appraisal of published trial reports. CONSORT 2010 focuses predominantly on the two group, parallel randomised controlled trial, which accounts for over half of trials in the literature.2 Most of the items from the CONSORT 2010 Statement, however, pertain to all types of randomised trials. Nevertheless, some types of trials or trial situations dictate the need for additional information in the trial report. When in doubt, authors, editors, and readers should consult the CONSORT website for any CONSORT extensions, expansions (amplifications), implementations, or other guidance that may be relevant. The evidence based approach we have used for CONSORT also served as a model for development of other reporting guidelines, such as for reporting systematic reviews and meta-analyses of studies evaluating interventions,16 diagnostic studies,17 and observational studies.18 The explicit goal of all these initiatives is to improve reporting. The Enhancing the Quality and Transparency of Health Research (EQUATOR) Network will facilitate development of reporting guidelines and help disseminate the guidelines: www.equator-network.org provides information on all reporting guidelines in health research. With CONSORT 2010, we again intentionally declined to produce a rigid structure for the reporting of randomised trials. Indeed, SORT19 tried a rigid format, and it failed in a pilot run with an editor and authors.20 Consequently, the format of articles should abide by journal style, editorial directions, the traditions of the research field addressed, and, where possible, author preferences. We do not wish to standardise the structure of reporting. Authors should simply address checklist items somewhere in the article, with ample detail and lucidity. That stated, we think that manuscripts benefit from frequent subheadings within the major sections, especially the methods and results sections. CONSORT 2010 supplants the prior version published in 2001. Any support for the earlier version accumulated from journals or editorial groups will automatically extend to this newer version, unless specifically requested otherwise. Journals that do not currently support CONSORT may do so by registering on the CONSORT website. If a journal supports or endorses CONSORT 2010, it should cite one of the original versions of CONSORT 2010, the CONSORT 2010 Explanation and Elaboration, and the CONSORT website in their “Instructions to authors.” We suggest that authors who wish to cite CONSORT should cite this or another of the original journal versions of CONSORT 2010 Statement, and, if appropriate, the CONSORT 2010 Explanation and Elaboration.13. All CONSORT material can be accessed through the original publishing journals or the CONSORT website. Groups or individuals who desire to translate the CONSORT 2010 Statement into other languages should first consult the CONSORT policy statement on the website. We emphasise that CONSORT 2010 represents an evolving guideline. It requires perpetual reappraisal and, if necessary, modifications. In the future we will further revise the CONSORT material considering comments, criticisms, experiences, and accumulating new evidence. We invite readers to submit recommendations via the CONSORT website. Author contributions: KFS, DM, and DGA participated in meetings and regular conference calls, planned the CONSORT 2007 meeting at Montebello, developed the agenda, prepared background research, identified and invited participants, contributed to the CONSORT meeting, drafted the manuscript, and, after critical review by the CONSORT Group, finalised the text of the manuscript. Members of the CONSORT Group attended the meeting, except for those noted below, and provided input on and review of the revised checklist and text of this article. Some members also prepared background material. The CONSORT Group contributors to CONSORT 2010: DG Altman, Centre for Statistics in Medicine, University of Oxford; Virginia Barbour, PLoS Medicine; Jesse A Berlin, Johnson & Johnson Pharmaceutical Research and Development, USA; Isabelle Boutron, University Paris 7 Denis Diderot, Assistance Publique des Hôpitaux de Paris, INSERM, France; PJ Devereaux, McMaster University, Canada; Kay Dickersin, Johns Hopkins Bloomberg School of Public Health, USA; Diana Elbourne, London School of Hygiene & Tropical Medicine; Susan Ellenberg, University of Pennsylvania School of Medicine, USA; Val Gebski, University of Sydney, Australia; Steven Goodman, Journal of the Society for Clinical Trials, USA; Peter C Gøtzsche, Nordic Cochrane Centre, Denmark; Trish Groves, BMJ; Steven Grunberg, American Society of Clinical Oncology, USA; Brian Haynes, McMaster University, Canada; Sally Hopewell, Centre for Statistics in Medicine, University of Oxford; Astrid James, Lancet; Peter Juhn, Johnson & Johnson, USA; Philippa Middleton, University of Adelaide, Australia; Don Minckler, University of California Irvine, USA; D Moher, Ottawa Methods Centre, Clinical Epidemiology Program, Ottawa Hospital Research Institute, Canada; Victor M Montori, Knowledge and Encounter Research Unit, Mayo Clinic College of Medicine, USA; Cynthia Mulrow, Annals of Internal Medicine, USA; Stuart Pocock, London School of Hygiene & Tropical Medicine; Drummond Rennie, JAMA, USA; David L Schriger, Annals of Emergency Medicine, USA; KF Schulz, Family Health International, USA; Iveta Simera, EQUATOR Network; Elizabeth Wager, Sideview. Funding: We received financial support from United Kingdom National Institute for Health Research and the Medical Research Council; Canadian Institutes of Health Research; Presidents Fund, Canadian Institutes of Health Research; Johnson & Johnson; BMJ; and the American Society for Clinical Oncology. DGA is supported by Cancer Research UK, DM by a University of Ottawa Research Chair, and KFS by Family Health International. None of the sponsors had any involvement in the planning, execution, or writing of the CONSORT documents. Additionally, no funder played a role in drafting the manuscript. Competing interests: Uniform disclosure of potential conflicts of interest: all authors have completed the ICMJE unified competing interest form at www.icmje.org/coi_disclosure.pdf (available from the corresponding author) and declare (1) DM received grants for this work from Johnson & Johnson, BMJ, and American Society for Clinical Oncology; KFS and DGA received support for travel to meetings for this work from Johnson & Johnson, BMJ, and American Society for Clinical Oncology; (2) KFS and DA had travel expenses reimbursed by the EQUATOR Network; KFS has received honoraria for delivering educational presentations for the American Board of Obstetrics and Gynecology Foundation for Excellence in Women’s Health Care, Ortho-McNeil Janssen Scientific Affairs, and the American College of Obstetrics and Gynecology; and has done consultancy for Wyeth. All authors also declare (3) no spouses, partners, or children with relationships with commercial entities that might have an interest in the submitted work; (4) no non-financial interests that may be relevant to the submitted work. In order to encourage dissemination of the CONSORT 2010 Statement, this article is freely accessible on bmj.com and will also be published in the Lancet, Obstetrics and Gynecology, PLoS Medicine, Annals of Internal Medicine, Open Medicine, Journal of Clinical Epidemiology, BMC Medicine, and Trials. The authors jointly hold the copyright of this article. For details on further use, see the CONSORT website (www.consort-statement.org). Chan AW, Altman DG. Epidemiology and reporting of randomised trials published in PubMed journals. Lancet2005;365:1159-62. Glasziou P, Meats E, Heneghan C, Shepperd S. What is missing from descriptions of treatment in trials and reviews? BMJ2008;336:1472-4. Begg C, Cho M, Eastwood S, Horton R, Moher D, Olkin I, et al. Improving the quality of reporting of randomized controlled trials. The CONSORT statement. JAMA1996;276:637-9. Moher D, Schulz KF, Altman DG. The CONSORT statement: revised recommendations for improving the quality of reports of parallel-group randomised trials. Lancet2001;357:1191-4. Moher D, Schulz KF, Altman DG. The CONSORT statement: revised recommendations for improving the quality of reports of parallel-group randomized trials. Ann Intern Med2001;134:657-62. Moher D, Schulz KF, Altman D. The CONSORT statement: revised recommendations for improving the quality of reports of parallel-group randomized trials. JAMA2001;285:1987-91. Plint AC, Moher D, Morrison A, Schulz K, Altman DG, Hill C, et al. Does the CONSORT checklist improve the quality of reports of randomised controlled trials? A systematic review. Med J Aust2006;185:263-7. Hopewell S, Dutton S, Yu L-M, Chan A-W, Altman DG. The quality of reports of randomised trials in 2000 and 2006: a comparative study of articles indexed by PubMed. BMJ2010;340:c723. Piaggio G, Elbourne DR, Altman DG, Pocock SJ, Evans SJ. Reporting of noninferiority and equivalence randomized trials: an extension of the CONSORT statement. JAMA2006;295:1152-60. Moher D, Hopewell S, Schulz KF, Montori V, Gøtzsche PC, Devereaux PJ, et al. 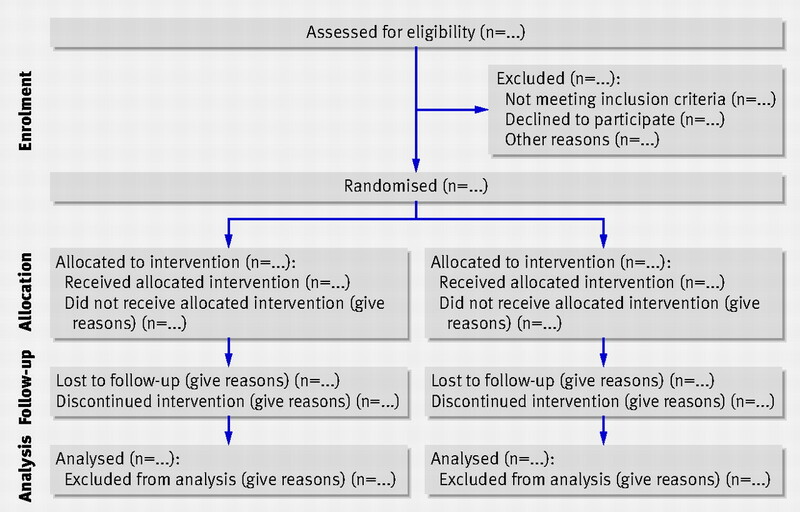 CONSORT 2010 Explanation and Elaboration: updated guidelines for reporting parallel group randomised trials. BMJ2010;340:c869. Schulz KF, Chalmers I, Hayes RJ, Altman DG. Empirical evidence of bias. Dimensions of methodological quality associated with estimates of treatment effects in controlled trials. JAMA1995;273:408-12. Moher D, Pham B, Jones A, Cook DJ, Jadad AR, Moher M, et al. Does quality of reports of randomised trials affect estimates of intervention efficacy reported in meta-analyses? Lancet1998;352:609-13. Moher D, Liberati A, Tetzlaff J, Altman DG, for the PRISMA Group. Preferred reporting items for systematic reviews and meta-analyses: the PRISMA statement. BMJ2009;339:b2535. Bossuyt PM, Reitsma JB, Bruns DE, Gatsonis CA, Glasziou PP, Irwig LM, et al. Towards complete and accurate reporting of studies of diagnostic accuracy: the STARD initiative. BMJ2003;326:41-4.
von Elm E, Altman DG, Egger M, Pocock SJ, Gøtzsche PC, Vandenbroucke JP, for the STROBE Initiative. Strengthening the reporting of observational studies in epidemiology (STROBE) statement: guidelines for reporting observational studies. BMJ2007;335:806-8. Standards of Reporting Trials Group. A proposal for structured reporting of randomized controlled trials. JAMA1994;272:1926-31. Rennie D. Reporting randomized controlled trials. An experiment and a call for responses from readers. JAMA1995;273:1054-5. Hopewell S, Clarke M, Moher D, Wager E, Middleton P, Altman DG, et al. CONSORT for reporting randomised trials in journal and conference abstracts. Lancet2008;371:281-3. Chan AW, Hróbjartsson A, Haahr MT, Gøtzsche PC, Altman DG. Empirical evidence for selective reporting of outcomes in randomized trials: comparison of protocols to published articles. JAMA2004;291:2457-65. Sackett DL. Commentary: Measuring the success of blinding in RCTs: don’t, must, can’t or needn’t? Int J Epidemiol2007;36:664-5. Schulz KF, Grimes DA. Blinding in randomised trials: hiding who got what. Lancet2002;359:696-700. Montori VM, Devereaux PJ, Adhikari NK, Burns KE, Eggert CH, Briel M, et al. Randomized trials stopped early for benefit: a systematic review. JAMA2005;294:2203-9. Hollis S, Campbell F. What is meant by intention to treat analysis? Survey of published randomised controlled trials. BMJ1999;319:670-4. Nuovo J, Melnikow J, Chang D. Reporting number needed to treat and absolute risk reduction in randomized controlled trials. JAMA2002;287:2813-4. Ioannidis JP, Evans SJ, Gøtzsche PC, O’Neill RT, Altman DG, Schulz K, et al. Better reporting of harms in randomized trials: an extension of the CONSORT statement. Ann Intern Med2004;141:781-8. De Angelis C, Drazen JM, Frizelle FA, Haug C, Hoey J, Horton R, et al. Clinical trial registration: a statement from the International Committee of Medical Journal Editors. Lancet2004;364:911-2. Lexchin J, Bero LA, Djulbegovic B, Clark O. Pharmaceutical industry sponsorship and research outcome and quality: systematic review. BMJ2003;326:1167-70. Hopewell S, Clarke M, Moher D, Wager E, Middleton P, Altman DG, et al. CONSORT for reporting randomized controlled trials in journal and conference abstracts: explanation and elaboration. PLoS Med2008;5:e20. Boutron I, Moher D, Altman DG, Schulz KF, Ravaud P. Extending the CONSORT statement to randomized trials of nonpharmacologic treatment: explanation and elaboration. Ann Intern Med2008;148:295-309. Gagnier JJ, Boon H, Rochon P, Moher D, Barnes J, Bombardier C. Reporting randomized, controlled trials of herbal interventions: an elaborated CONSORT statement. Ann Intern Med2006;144:364-7. Zwarenstein M, Treweek S, Gagnier JJ, Altman DG, Tunis S, Haynes B, et al. Improving the reporting of pragmatic trials: an extension of the CONSORT statement. BMJ2008;337:a2390.